As most of you already know, I love Mod Podge. It's think it's the wonder ingredient of the crafting world. I especially love Sparkle Mod Podge, but for today's project I held back and just used the regular stuff. I've been wanting to do this project for awhile now and when I picked up this wooden chair for two whole loonies (that's 2 dollars for those of you outside of Canada) at a garage sale, I knew I was ready to go! 1) Check to see what the repeat pattern is on your napkin. You could use tissue paper instead and probably get a big more bang for your buck, but I really liked these napkins. You only need to do this for the seat. Everything else will be pieced together and eventually you'll just start tearing and using scraps. The first piece gets laid down as one whole piece though so you'll want to figure out which way you want the pattern to go. 2) My napkins were 3 ply. The first one I glued down I kept getting air bubbles because of so many layers of paper. I learned very quickly to take the layers apart first and use only the patterned layer. The rest was for wiping the glue off of my hands. 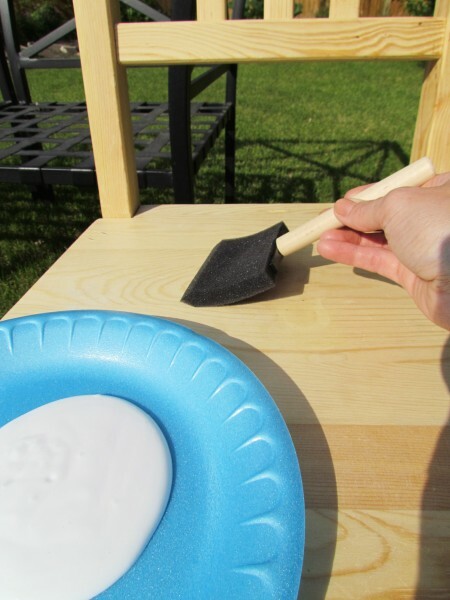 3) Pour some glue out onto a paper plate and get ready to paint it onto your chair. The rest is basic Mod Podge but I'll go through it anyway, just in case there's someone out there somewhere who hasn't taken the Mod Podge plunge yet. 4) Paint one layer of Mod Podge directly onto the chair. 5) Lay your napkin down and paint another layer of Mod Podge right on top of the napkin. 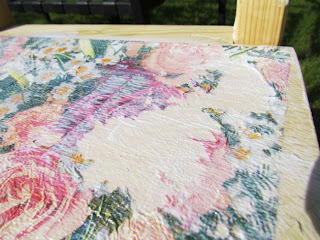 Mod Podge dries pretty quickly so you have to work fast. Make sure you go over all of the edges to seal them. 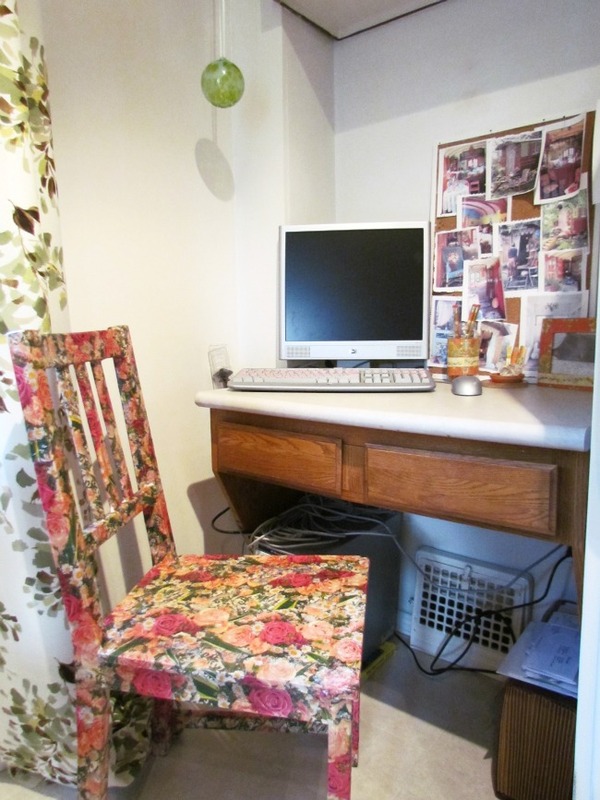 6) Keep going all around the chair, making sure to get every little nook and cranny and spindle. As you start getting into smaller spaces you can just tear your napkin. Ragged edges are totally fine, if you have a busy pattern like mine it'll all just blend nicely. By the way, I should probably mention that this is not something you want to do after an expensive manicure. It does get messy. I've got Mod Podge on my hands, my arms, my jeans, and I think even in my hair right now. It all comes out easily, except when it's on top of nail polish, then it pulls the polish off too. It's all worth it though, take a look!! I think it's just about pretty enough to be in the garden but it's actually going in front of a little built in desk in my kitchen. Please excuse the mess of cords and the blahness of the walls. This is the first step of an overhaul of my kitchen, almost the last room on my list of major make-overs. I think this would be a fun craft to do with kids actually. They like getting messy right?!?! It took me a couple of hours and about 10 napkins to cover the whole chair. I think it's fun and whimsical. I can totally picture it with Mod Podge Sparkle but I'll try to ignore my 10 year old self and leave it as is. Have you ever decoupaged something big? While I was doing this I was thinking it would be pretty funny to do an entire dining room set or a bed frame or something. You'd need a lot of Mod Podge but it could be fun. Anyway, let me know what you think and if you're going to find something to cover in Mod Podge and Napkins. I'll be linking up at the parties from the linky party tab up top. Check them out to find loads of other great ideas. And make sure if you've hit the follow button on the side bar to add your blog button to the Follow My Friends page up top. That is quite the transformation! Your kitchen nook looks really nice already. Happy garage sailing this weekend! and i didn't knwo hodgepodge . Seems a nice product ! That's awesome!! 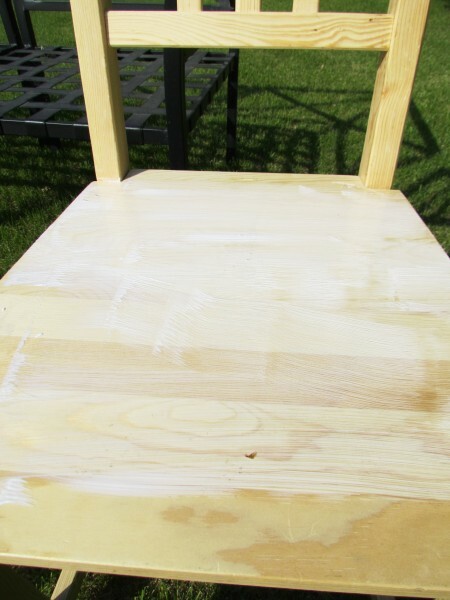 I have a chair on my front porch that needs some lovin', and I'm thinking this will work perfectly!!! Such a cute chair - looks SO pretty!! Wow... you did a fabulous job on that chair!!! Very nice, I never thought paper napkins would hold up. wow- love it!! looks amazing. i took the mod podge plunge in the middle of spring and mod podged some maps onto stools for my french classroom. they've held up well. i was sure after a few wiggly butts sat on them, i'd have tears and scuffs, but they seem to be fine. and the kids actually notice the maps. i put like a million layers of mod podge to make a thick top coat and it seems to have worked. go check it out my blog by typing in maps in the search area. this chair is really something. i never would have thought napkins would take the stress of all the brushing! Love the chair! Is it tacky to the touch? I did a plate years ago and it is still tacky. Just Beautiful!!! Love working with napkins -- I have a whole box full of them that I've collected! Yet another use for them! Hi guys, thanks so much for all of the lovely comments! I wanted to make sure to answer Lissa's question here so you're not all wondering. I actually sat on the chair last night and it isn't tacky at all. Everything dried super quick and it's totally useable. The chair is so beautiful! I think this chair is beautiful! I saw a rocking chair with that look that I want to recreate! Thanks for sharing! I've decoupaged the same way with napkins, but on birdhouses. 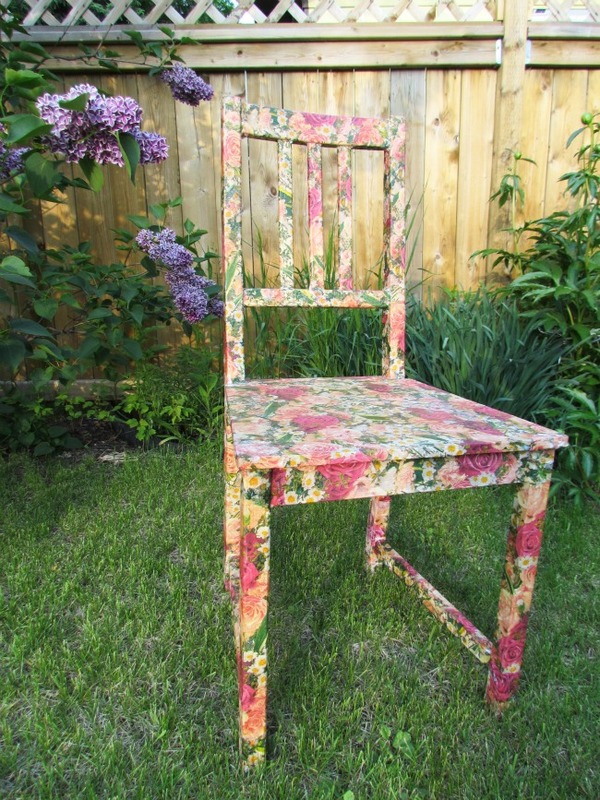 Never tried a large project like this, but I love the pattern and colors of your chair. Never tried the sparkle Mod Podge either, but now you are making me wonder what I'm missing! 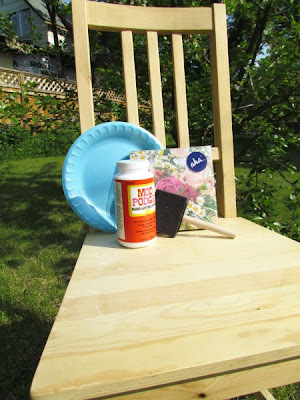 I love Mod Podge too! Though I never though to cover a whole chair with napkins, that's a great idea. Will have to keep this in mind for the future, so I'm totally pinning it! I never thought of using napkins. Great idea! SOOOO cute! I will be trying this. I have the perfect chair! I'll take ten of them!!!! Or maybe I'll make them. This is so cool! Thanks so much for posting this tutorial!! I'm planning to cover a metal lawn chair, and gained good info from you. 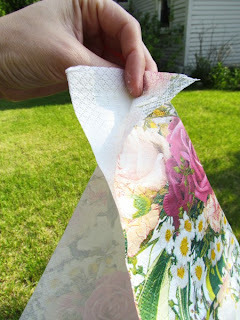 I was originally planning to use fabric, but will switch to tissue now - but i do plan to use outdoor Mod Podge. Thanks again!! Great job! Love the new look! I am a new follower! Please come visit my blog! Love it! We just moved and need some new accent pieces.... definitely going to try this! This is just beautiful! I'm so surprised that it only took 10 napkins, though. I guessed it would take several packs of napkins! Just wanted to answer Marg's question because I get it quite often...how do you seal it and do you stick to your chair now??? The answer is, all I used was Mod Podge. No fancy sealer, nothing. I didn't use gobs and gobs and so it only take overnight to dry and believe it or not I could sit on it the next day. In fact, I sit on it every morning and not once have I gotten stuck. I don't think it would hurt anything to add a sealant but I just didn't find it necessary for this project. Hope you all give it a try and can't wait to see what you come up with. This is exactly what I've been looking for to re-create a chair I salvaged. Thanks for the idea, it's awesome! I always have a wooden chair in my garden with a plant sitting on the seat. 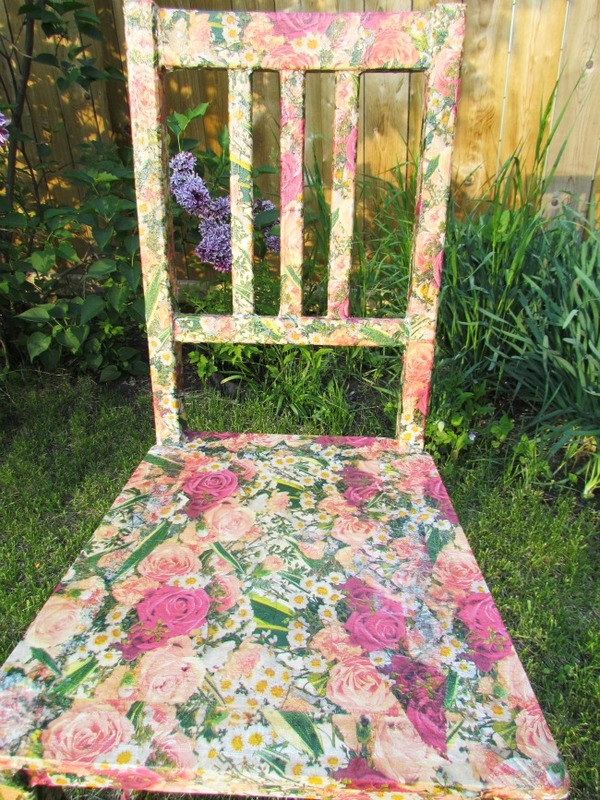 Last year I found a great wooden chair in someone's garbage and have been thinking about doing something with Outdoor Mod Podge. This is a great idea, I think I'm going shopping for napkins! Modge Podge totally ROCKS! *grin* I adore what you did with your chair.. too super cute! I use the stuff all the time in card making and now I'm gonna have to start using it on furniture! LOL Thanks for the great idea. love this chair! wondering about using wrapping paper instead of napkins? have you ever mod podged with wrapping paper? i'm going to have my 2 yr and 4 yr old grandsons help! they will love doing it - and never too young to start crafting! Hi Sarita, I've never used wrapping paper but I've definitely thought about it. There's so many different kinds of beautiful paper out there. Trying them all out is half the fun! Love the chair!! I saw this done on a chair set and an old couch back at a store in Arlington, TX. They had taken childrens wrapping paper and Modpoged it on. Really adorable! Now that I've seen yours, I really have the bug to try this! Brilliant. Thank you so much. This was so helpful. 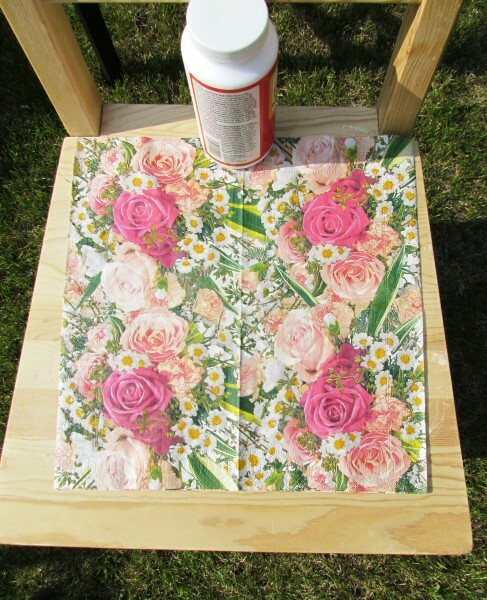 I am using pretty cath kidston napkins to decoupage an Ikea side table and I have not sealed it yet as I noted the napkins were starting to break up easily. But you have out my mind at rest. I will be mod podging in the morning. Hi! I'm wondering, how well has this held up? Does it get worn over time or do you not sit on the chair too much? Thanks! 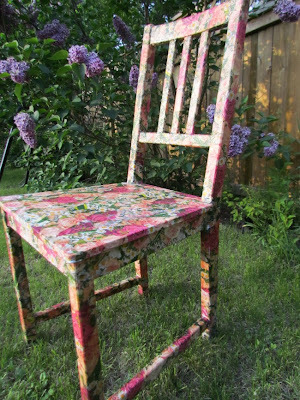 A client needs me to make a chair and instead of hand painting, I need to mod podge some paper on! What a lovely chair! I appreciate your responses to Marg and Sarita's questions. Looking at the "before" chair, I would like to know if you sanded it before you began. No, I didn't sand it down first. I find fussy work like that usually isn't necessary when decoupaging...on the other hand, it certainly wouldn't hurt anything if that's something you'd like to take the time to do. That is a really cool chair, I love it & I'm definitely going to try it. and just hope for the best. If there's anything else I shoudl know, this is the time to tell me. Stay tuned!